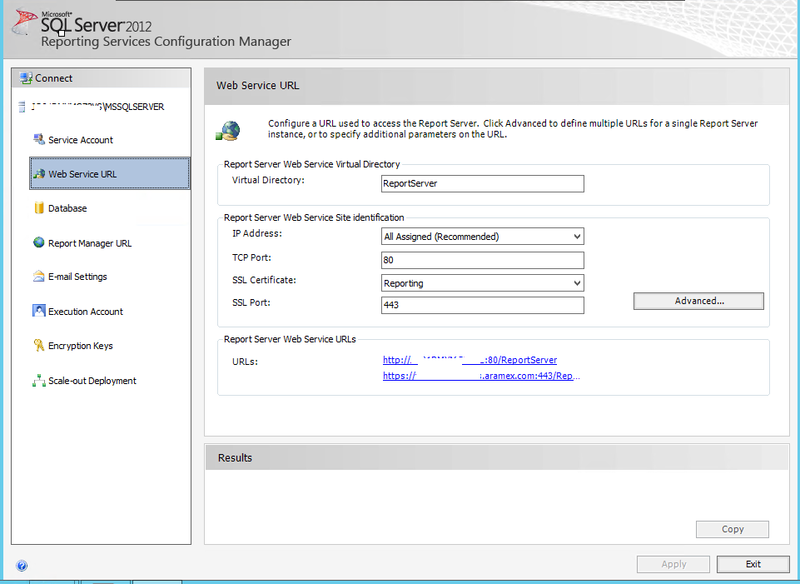 Hi everyone, i was configuring Reporting Services for Configuration Manager 2012 R2 that day, and i got two annoying issues when it comes to SSL binding. I want to share with you the two issues and how I solved them. So you have a certificate in the personal store in the reporting server with name SRV-1.contoso.com, you already configured a certificate binding via the (Web Service URL) in the Reporting Services Configuration Manager. Now, you want to change the URL name, and thus the certificate, so you went to the certificate store and deleted the certificate for SRV-1.contoso.com before you use the Reporting Services Configuration Manager to unbind it. Now every time you try to add another certificate, the Reporting Services Configuration Manager keep showing the old name that exists in the old certificate, or worse, display an Unknown URL like https://unknown.contoso.com/reports... .
Also the following event appears in the event viewer. Event ID 110, Source: “Report Server Windows Service”, Details: “The value for UrlRoot in RSReportServer.config is not valid. The default value will be used instead”. To investigate more, i went to the configuration file on the reporting server located here: C:\Program Files\Microsoft SQL Server\MSRS11.MSSQLSERVER\Reporting Services\ReportServer\rsreportserver.config. On the file, you can find all binding including the one for the old name SRV1-contoso.com. 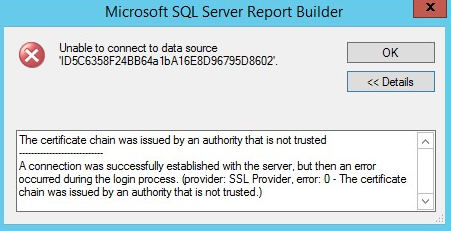 So you are running Configuration Manager (20120 r2 in my case), and you have a reporting service (in another machine in my case), and you want to build a report, so you have your SQL report builder (Version 3 in my case), and when you try to do certain actions, you will get ugly errors about certificate chain not trusted. 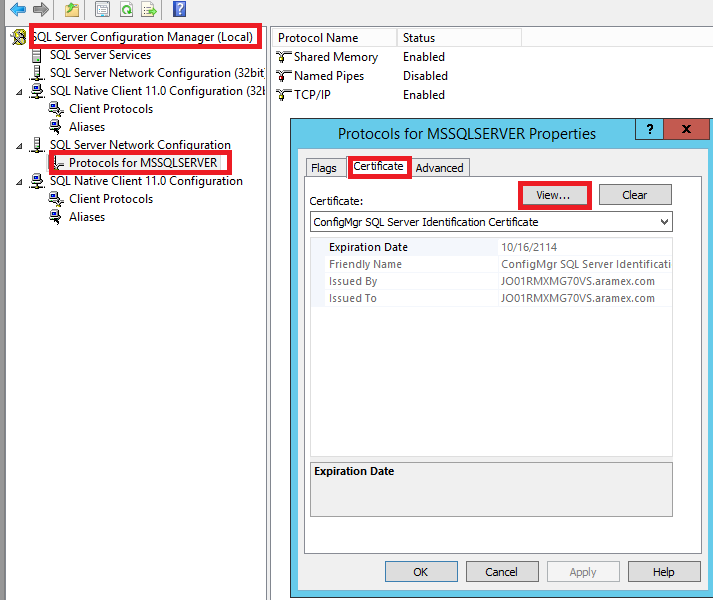 Reason is simple: SCCM SQL server is using self signed certificate for this operation. You have either to trust this certificate on computers you are running the SQL report builder from, or issue a trusted Web Server certificate and assign it to the SCCM SQL server. The best way to find out where this self signed certificate is located, is by going to your SCCM SQL server, open the SQL Server Configuration Manager> SQL Server Network Configuration>Protocols for… > Right click properties> Certificate tab and then click view. Tip: a good reference that I recently read after posting this blog post can be found here. Check it out.